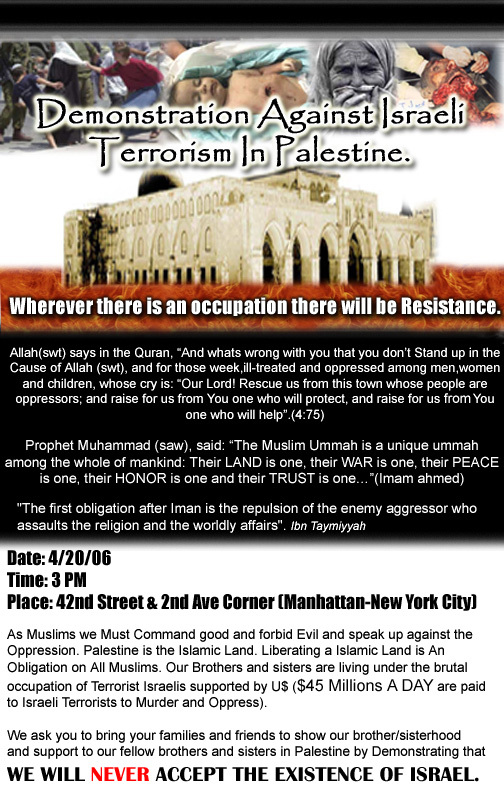 .It is no coincidence that the ITS is located in Jamaica, Queens,which is the headquarters of the ICNA organisation. The Islamic Thinkers Society has ties to the ICNA Young Muslims organisation - an Islamic 'Hitler Jugend'. Prior to 9/11 Young Muslims organised Jihad Camps and Afterlife Camps in the United States. YM runs numerous Islamist indoctrination programs - such as Neighbornet- and exhorts their members to proselytise Islam. Their ideological tenets are those of the Muslim Brotherhood (The Ikhwaan), the precursor of Al Qaeda. Abdullah Azzam, Bin Laden's mentor, was a member, as is Yusuf Qaradawi, who is listed as a trustee of the Islamic American University on the MAS website. According to Dr. Daniel Pipes, the overt calls for Jihad are indicative of a worrying new trend showing that Islamist groups are no longer concerned with keeping up a facade of civil discourse They are bringing the fundamentalism of the Middle East into Manhattan. "This (demonstration) is potentially an important event, for until now, American Islamists have mostly been polite, pretending to be loyal, forging alliances, working the system. This approach sometimes earns them an earful from their more impatient colleagues (I noted one such missive at "Cut the Apologetics, a Muslima Advises CAIR"), but rarely and obscurely so. We are a handful of like-minded Muslims from Ahl us-Sunnah wal jama'ah, who invite others to Islam from the Ideological perspective which is to invite to the Aqeedah(belief, Tawheed, Imaan) as well as to the shahriah(system, rules, commandments) as this is what is being meant in the ayah when Allah s.w.t. uses the word "khair". MIM: Steven Emerson's Investigative Project documented the anti Israel event and is posting a video on their website. An estimated 1,500 to 2,000 Muslims protested peacefully across from the Danish Consulate in Manhattan Friday in the largest U.S. rally to date against a Danish newspaper's decision to publish caricatures of the prophet Muhammad. "We have to restrain our anger," urged Imam Siraj Wahhaj, who led Friday prayers before hundreds of people who were prostrate on tarps, plastic bags and rugs laid atop wet asphalt. "We have to make our response productive, so that they never do this again."